All that furniture we moved into the basement, shipped out to the cottage, or dropped at the curb, hoping someone would take it away. The dull-looking teak wood, sticky with aging varnish and with too many children’s mucky hands. Much mid-century furniture was uncomfortable and awful, and yet we wish we had it today, because it would be perfect in the small spaces of our compact lives. Also, no matter how much we reject the label, it would prove we were proper hipsters. The cracking tensioned leather or shaped plywood seats, the stainless steel supports—it all made for a distinctive style and visual impact on a space. The predominantly silver jewels of the same mid-century period had a similarly strong, positive impact on the style of wearers at the time. Perhaps we’d love to have all that mid-century modern stuff because it really is cool. Those simple, organic forms are made from basic materials without a lot of superfluous ornamentation. The designs are notably rudimentary and practical, but despite this—or perhaps because of it—they have an understated beauty unlike anything before or since. In jewellery at this time, there were uncomplicated but effective shapes and finishes. There was also widespread recognition of artists, designers, and creators. Historically, there haven’t been many times when the artist who designed a decorative household or personal item was recognized or even identified at all (although the company or house sometimes was). In the mid-century period of Northern Europe, perhaps there was a more egalitarian view of the world, as there tended to be a greater awareness of the designers behind many of the jewels. Shapes were usually basic, often exhibiting simple geometric elements. These designers—like those creating furniture or candlesticks—focused on minimal, beautiful, and practical form and materials. Ostentation was not part of the design. In jewellery, the mid-century revolution was led by Danish designers, but accompanied by artists from Norway and Finland and followed by designers around the world. These jewels were straightforward in form and shape, and generally had basic and uncomplicated textures. This design style had no time for anything unnecessary. Scrolls and flourishes were for another time and place. The purpose of the artists was to make something simple, attractive, and in no way boastful. Preceding the mid-century period, the late 19th century saw a development in artists and creators designing in what we now call ‘arts and crafts,’ with artists designing and building handcrafted items that were generally not costly. This was a reaction to the industrial revolution, as people felt the human touch in personal and household items was being lost with the growth in mass production. The arts and crafts movement produced decorative household items, wallpaper, and jewels that were often highly ornamented, one of a kind, and representative of naturalistic forms of leaves and foliage. There was a focus on the craftsperson and the individual item. Mid-century modern design relies on simple, organic forms made from basic, yet beautiful materials without fanfare. In keeping with this sentiment, the designers of the mid-20th century produced items that were not only useful, but also beautiful. 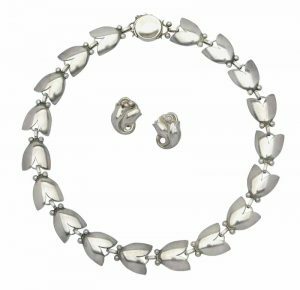 However, a difference between the elements of nature represented in the arts and crafts jewellery of the 19thcentury and those displayed in the mid-century modern period is shapes and forms used. In mid-century modern jewellery, shapes were usually basic—often exhibiting simple geometric elements. Generally, the finish was also simple, and was hammered, polished, or sometimes brushed, with the occasional use of enamel to add colour. Jewels from most earlier and later periods were more ornate, with flourishes, leaves, flowers, bows, and often heavily textured finishes. As mentioned, designers of the time worked predominantly in silver, usually with no gemstones, except perhaps for the purpose of accentuating the design. Even then, there were generally no sapphires, rubies, diamonds, or other major gemstones, because the design was paramount and gems were secondary. An important element of these designers’ work was the need to remain affordable. There are two aspects to this: being affordable to buy and, perhaps just as importantly, being affordable to make. If any sculptural jewellery (i.e. jewellery allowing people to wear a small, beautiful sculpture) was being made, silver was a much smaller investment for a jeweller than gold. This meant artists could make items without enormous outlay and keep inventory available. 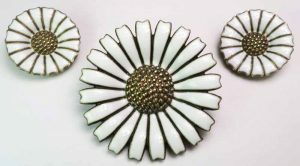 Anton Michelson’s design of a daisy is a slight departure from the mid-century modern period’s typical style, because it is more representative than most jewels of the time, but it still has the plainness of line and materials that was so common among mid-century modern jewels. 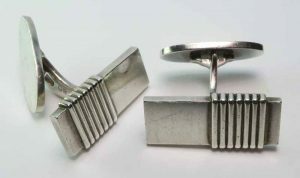 Among the most famous mid-century modernist jewellers were a number from Denmark and Norway. Many were trained as sculptors, and turned to jewellery as a way of creating sculpture that could be worn on a daily basis and purchased without great expenditure. This allowed the purchaser to own a larger number of pieces of the designer’s work, or multiple designers’ jewels. There are lots of names that are prominent in the world of design. Though they are no longer with us, these designers’ work is so classic, the houses under whose banner they worked still produce their designs. For instance, there are dozens of designers named under the banner of Georg Jensen, a single Danish company. Danish sculptor and entrepreneur Georg Jensen—who died in 1935, well before the mid-century period—had an eye for design and style. He sought out and employed or commissioned designers such as Henning Koppel, Harald Nielsen, and Edvard Kindt-Larsen and his wife Tove. 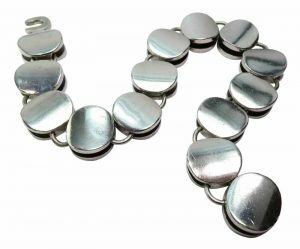 The name of Georg Jensen prevailed through the mid-century period, with his personally selected artists leading the style of the time and carrying his name forward. These craftspeople brought a diversity of skills and experience to their work, but produced a certain unity in the mid-century modern style. Another of the most prominent and often-collected designers was Danish artist Niels Erik From, who had a focus on simplicity and often used enamel and cabochon-cut gemstones to create a unified and timeless design. Anton Michelson’s design of a daisy is a slight departure from the period’s typical style, because it is more representative than most jewels of the time, but it is still one of the designs popular today. It has the plainness of line and materials so common among mid-century modern jewels. The mid-century modernists also counted among their number a good proportion of women. One such woman was Norwegian designer Anna Greta Eker, an industrial designer who brought the detail and precision of her training to silver jewellery, to great effect. Another Norwegian artist whose work is widely sought after is David Andersen. His enamel work on silver and silver-gilt brought colour to jewels of the period. There are dozens of designers named under the banner of Georg Jensen, a single Danish company that designed in the mid-century modern style. Perhaps it is fortunate the jewels of the mid-century modernists were small—because they didn’t take up much room, we (or our parents) didn’t feel a need to clear them out as we did with the furniture. Also, given these jewels were mostly made of silver, there was no big benefit in melting them as many people have been doing with gold. It’s worth rummaging through the old accumulation of jewels in the back of that drawer or box, digging out that mid-century modern silver, and trying it on—or at least offering it to your hipster friends to wear as they lounge on their uncomfortable mid-century modern furniture.